Handing over the check to the Landing! 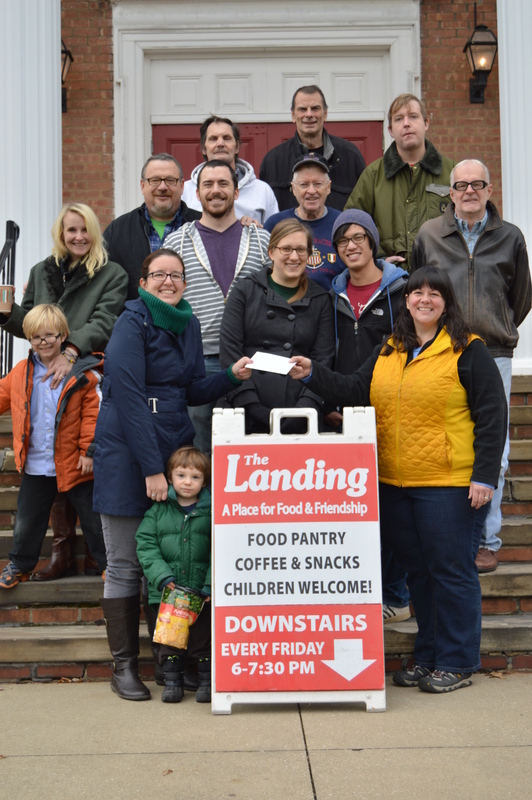 Friday, December 5, 2014, I had the joy and privilege of delivering a check to the Landing Food Pantry in Akron, Ohio because of YOU, my readers. 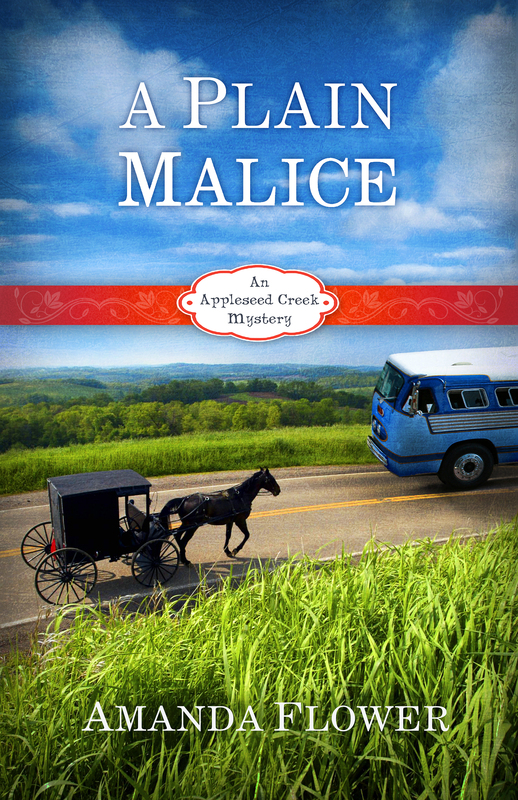 In September, I published A Plain Malice, the fourth and final novel in the Appleseed Creek Mystery Series and decided to donate 100% of my royalties I earned through Thanksgiving Day to the Landing. The support and excitement from my readers was amazing, and because so many of you bought the novel and shared news about it with your friends and family, I gave the Landing a check totaling $4,420.81!! My brother and sister-in-law, Andrew and Nicole Flower, manage the Landing in the basement of Akron Christian Reformed Church with a group of dedicated volunteers. The food pantry feeds over sixty families in the church’s neighborhood on $200 per week. You can learn more about the Landing in this article and video recently published in the Akronist. You can read the original post about the giveback plan here. Thank you and God bless you! I’m truly humbled by the outpouring of support for the Landing and for my writing. Yes, it’s time once again for “Everything you wanted to know about Amish authors but were afraid to ask.” Of course, maybe you aren’t afraid to ask but just haven’t known whom to ask. Well, wonder no further. Jennifer Beckstrand has gathered eight Amish authors together to ask them the burning questions. If you have a question for our authors, please send leave it in the comment and I will forward it to Jennifer. 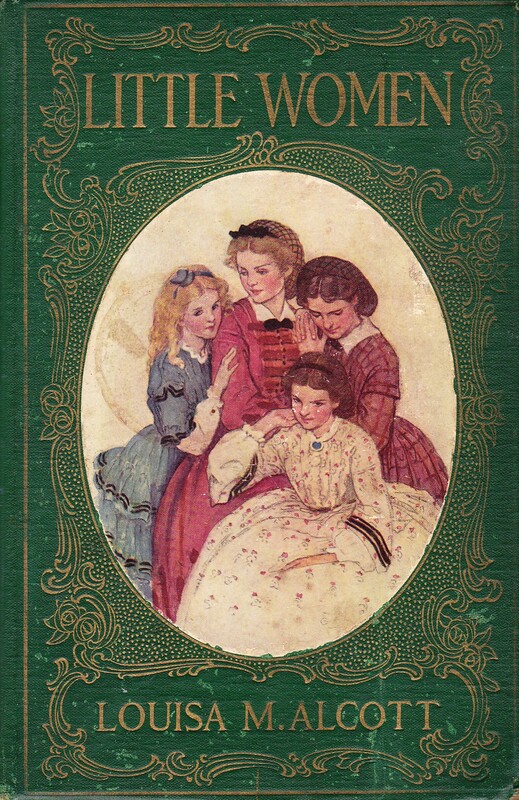 Mary Ellis: I adored Little Women by Louisa May Alcott. I got the impetus to become a writer “when I grew up” from Jo March. I received my first copy around 8 (a highly abridged illustrated edition.) I now own several editions, my favorite being a 1904 copy published by Little, Brown, and Company of Boston. On my bucket list is to find a first edition released by the University Press in Cambridge, Mass. I have been to her childhood home, Orchard House, where she penned her lovely tale in Concord, Mass. Okay, now you know I’m a Louisa groupie! Amy Clipston: My favorite book when I was a little girl was Elizabeth by Liesel Moak Skorpen. It’s out of print now, but I have a copy that I cherish. I also knew Good Night Moon by heart. My mother would turn the page, and I would recite it. When I was in junior high I read The Outsiders until the book fell apart. I also knew the movie by heart. I recently bought a set of S.E. Hinton books for my older son. He hasn’t opened one yet, but I’m not giving up hope yet! Vannetta Chapman: Oh, golly yes! Whenever my mind draws a blank — I just put in something from life! In my new release, Murder Simply Brewed, the romance is very similar to the story of me and my husband. I love bringing fragrance into my home. That’s one of the reasons I became an independent consultant for Pink Zebra. Pink Zebra is a direct sales company for home fragrance products. We make Sprinkles, a unique scented wax melt. The wonderful thing about Sprinkles is that because of their small size, they blend really well. So, even though we have over 50 scents, you can mix and combine to create your own personalized fragrances! As I was reading Isabella Alan’s Murder, Plain and Simple I could imagine myself walking around Rolling Brook, Ohio. To make it even more real I began to smell…apples, and to help celebrate Watermelon Fest-watermelon! I was inspired by the book to create a scent that would always remind me of it, and I can do that because I’m a Pink Zebra! I got my Sprinkles and mixed. Equal parts of Red Delicious Apple and I Love Watermelon became Amish Festival, my Pink Zebra recipe inspired by Murder, Plain and Simple. I came up with that recipe for the whole book, but you could create recipes for individual characters as well. For Rachel, what about mixing Blueberry Muffin with Mom’s Lemon Bars? Or perhaps Chocolate Whoopie Pie and Vanilla Crème? 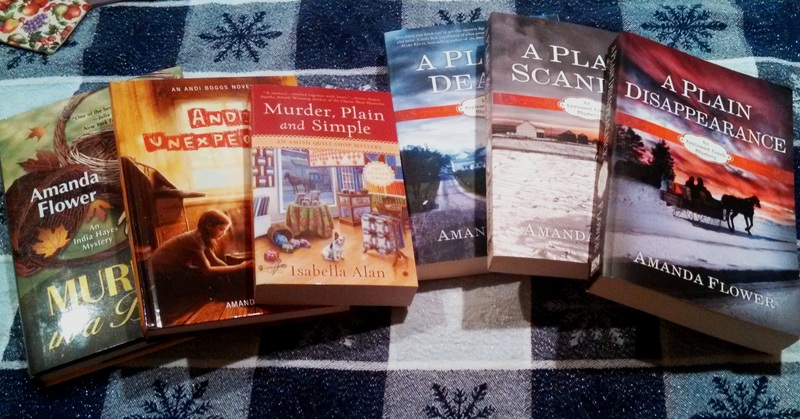 When thinking about Amanda Flower’s Appleseed Creek Mystery series I came up with a blend inspired by the whole series thus far. Red Delicious Apple (of course, it is Appleseed Creek) and Citrus and Herbs. I call that recipe Amish Countryside. It’s wonderful to be able to combine my love of mysteries with my love of home fragrance-and my new business. I’d like to share Pink Zebra with you. 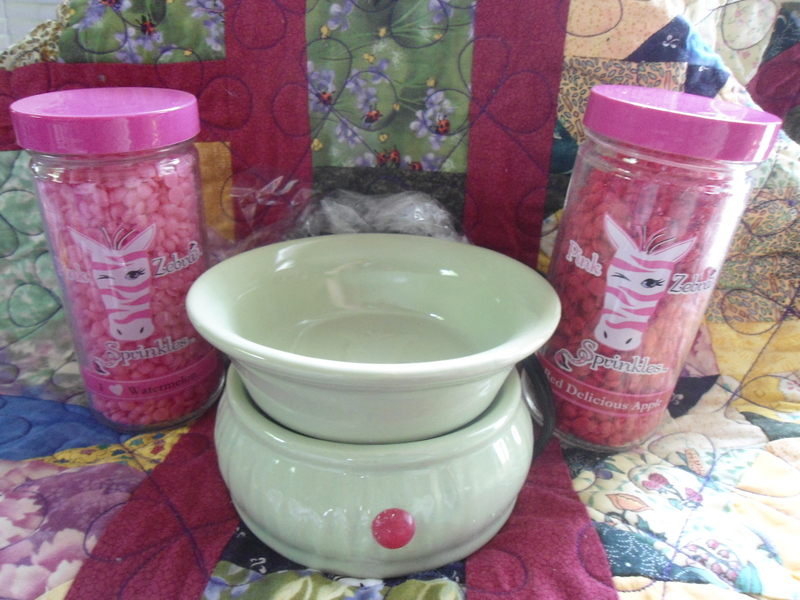 One winner will receive a light green simmering pot and 2 jars of Sprinkles, Red Delicious Apple and I Love Watermelon in celebration of the release of the Amish Quilt Shop Mysteries. I trust that melting these scents will transport you to the Amish Countryside. 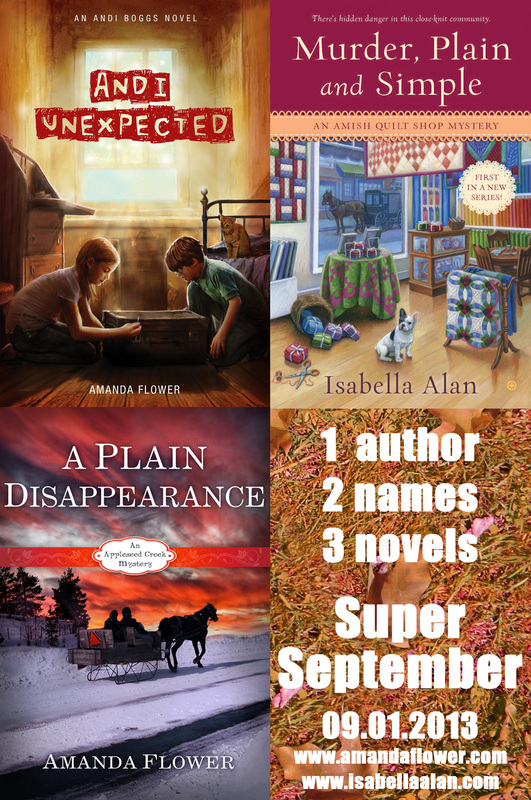 Leave a comment on this post telling us what we like about Amish mysteries or novels with your email address. Amanda will chose a winner from the comments. 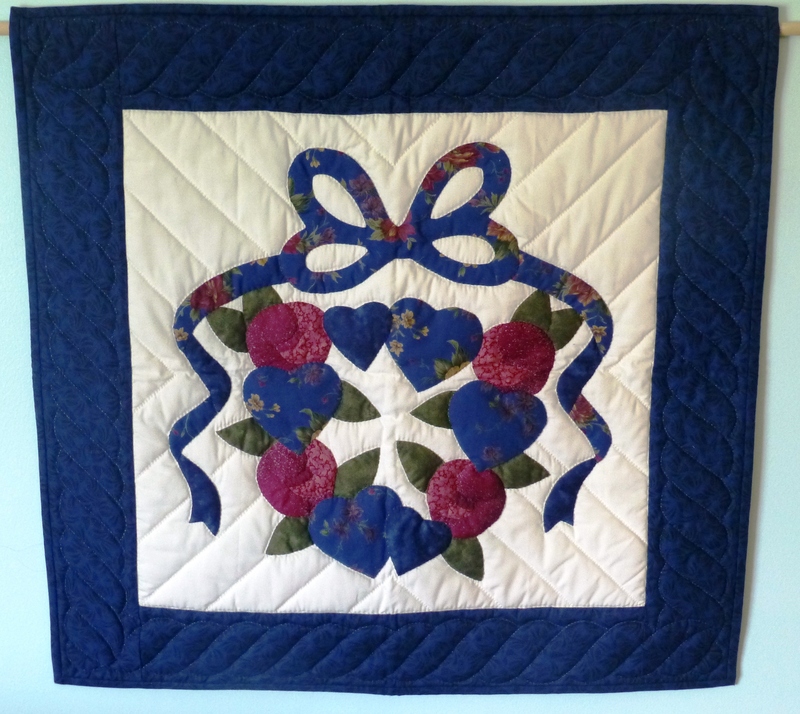 Contest ends Tuesday, September 24 at 4pm EDT. Winner will be announced in the comments to this post on Wednesday, September 25. I hope I’ve piqued your interest in Pink Zebra. Let me tempt you to create scents for your favorite mysteries and characters. Come check out my Facebook page (https://www.facebook.com/CricketHollowSprinkles ) and website (http://www.pinkzebrahome.com/crickethollowsprinkles) where you can order any time you’d like. If you have any questions about Pink Zebra, please e-mail me at CricketHollowSprinkles@aol.com. Come meet me at a Book Talk or Signing this Fall!